So you are eating all your fruits and veggies, getting sufficient calcium, magnesium, and other important nutrients for building strong bones—that’s great! You may also consider one other addition to your daily routine to help keep those bones healthy and strong—exercise! New research illustrates that women who incorporate regular exercise into their routines have greater potential for building bone mass than those who do not. While it is important to note that this study was conducted on premenopausal women, this does not mean that if you have already hit menopause that exercise is not helpful—it is never too late to adopt healthy habits. However, it does indicate that the sooner we start, the better chance we have of preventing diseases such as osteoporosis. Be proactive and find out how to start preventing osteoporosis today! The importance of regular exercise is well-known and is often discussed in light of weight management or heart health, but now we know it is also important in maintaining healthy bones. It is important to note that the recommendations suggest a moderate level of exercise, not vigorous. You don’t have to run a marathon to get the benefit of stronger bones, so don’t be intimidated to get out and moving! Rather than spending 5 minutes driving around the parking lot looking for the closest spot, drive straight to the back and spend 3 minutes walking to the door, and 3 minutes back to the car. That banks 6 minutes! 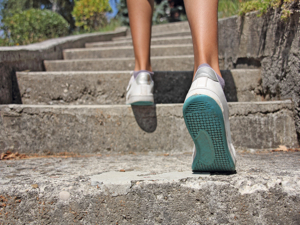 Each and every one of those steps counts towards your goal of walking 30 minutes a day. A couple of flights throughout the day gives you another 5 minutes of walking. …after all, it is just around the corner. Leave your car at home as much as you can. If you live in a city, there are ample opportunities to walk throughout the day. If you are in a suburb, there are more possibilities than you may imagine—ask yourself if you can make the trip without the car before you reach for the keys. One trip to the store equals 10 minutes of walking. Instead of asking for favours throughout the day: “Can you pass the remote?”, “Can you take out the garbage?”, “Can you get me a glass of water?”—help yourself to what you need each day, rather than asking someone else—you will add precious minutes towards your goal. …but move around during the commercials! Commercials are not all that exciting anyway, so get up to make some herbal tea, put in a load of laundry, make the kids’ lunches, or fold some clothes. Whatever chores you may have, getting up and moving around each commercial break adds a whopping 14 minutes (on average if watching an hour-long program). If you have already done your chores, then even try standing and walking in place during commercial breaks. You could bank another 8 minutes, because let’s be honest, some commercials are just too good to miss! Following these tips can add an estimated 34 minutes of walking each day, without even thinking about the gym. That’s more time than needed to build healthier bones so give it a try!